Today, Dr. Orly Taitz, ESQ is in court to challenge the Secretary of State of Indiana‘s right to dismiss her previous ballot challenge against President Barack Obama’s place on the 2012 ballot. She is reportedly bringing 7 witnesses, although her most relevant witnesses (Sheriff Joe Arpaio, Mike Zullo and “Senior Deportation Officer” John Sampson), have refused to appear, claiming that Orly Taitz is a “Circus Show”. Taitz subpoena’d them and even filed a Motion to Compel Sheriff Joe in Arizona court to appear at the Indiana hearing today. You have to wonder what their actual motivations are if they can submit sworn affidavits to courts but refuse to back them up with actual in-person witness testimony. Could it be that they do not actually believe the affidavits they signed and thusly cannot risk perjuring themselves on the witness stand? Time will tell. 7:42pm EST: Part 3 of A Legal Lohengrin’s 3 part Exclusive and detailed Report on today’s proceedings. 6:35pm EST: Pamela Barnett’s eyewitness account: Judge Reid has not made a ruling. Orly did a great job when I saw her before I was sequestered out of the room. I didn’t get to see the other witnesses. but everyone said the IN attorney general attorney was acting for Obama watching the evidence being testified to… challenging everything. He and the judge both seemed to be intentionally trying to drag out the time so Orly wouldn’t have enough time to get to all of the witness testimony. The judge heard a motion to stop the trial even though she shouldn’t have because it was only filed the day before and Orly has 15 days to file a reply brief. This took over an hour of the court time which cut into the witness time. The tyrannical state attorney kept repeating his arguments over and over to waste time. Paul Irey and Chitto Papa testified to the forged birth certificate and instead of being concerned about protecting the state of Indiana from vote fraud, he went on the attack for Obama. Strunk got to testify to the fact Obama has the alias Soebarkah and that was it. Before witnesses could start testifying finally, Orly had kept reminding the Judge that she had paid thousands of dollars to bring all of the witnesses there to try to speed up the proceedings. But in the end the judge abruptly cut the trial off even though she was hearing testimony regarding an issue of national security and Bob Kern and I did not get to testify. She didn’t even let my documents be put on the record. Orly remained positive. She was very happy with Irey’s and Papa’s testimony. 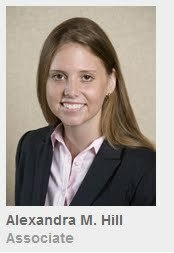 She feels that any honest person that saw the testimony would “know obama’s “Hawaii birth certificate” posted at whitehouse.gov is a forgery. Sorry that I was not able to testify. I had prepared many, many hours. The fight goes one. 6:19pm EST: Part 2 of A Legal Lohengrin’s 3 part Exclusive and detailed Report on today’s proceedings. 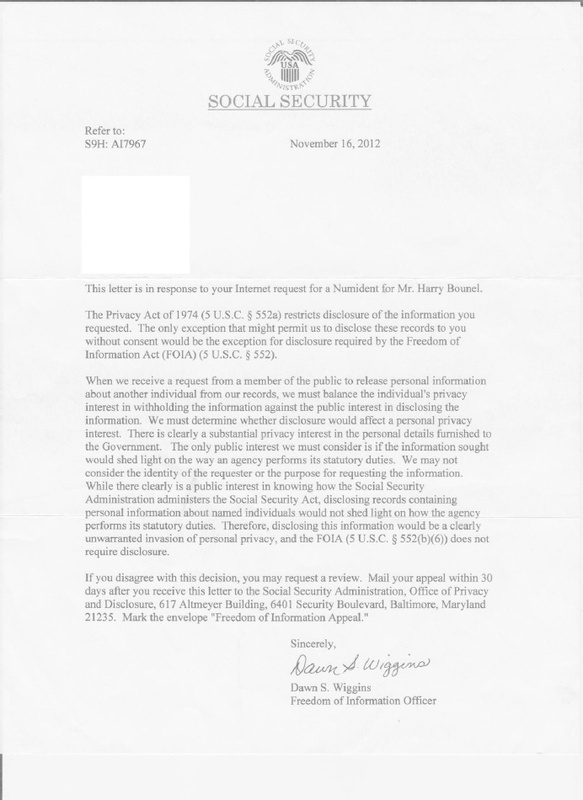 5:40pm EST: Orly Taitz Press Release: Today a trial was conducted in Indianapolis Indiana on the issue of Daclaratory relief and injunctive relief due to Obama’s use of forged Birth Certificate, Selective Service Certificate and a fraudulently obtained Connecticut Social Security number 042-68-4425. Presiding Judge is a superior court Judge Sherry K. Reid. For the Plaintiffs appeared attorneys Orly Taitz and local Indiana counsel Greg Black. For the defense appeared Deputy Attorney General Kenneth Joel and Deputy attorney general Jefferson Garn. Over an extremely rigorous objection by the defense, Judge Reid admitted into evidence exhibits and testimony of witnesses Paul Irey and Felicito Papa. Mr. Papa testified that he graduated from the Indiana Institute of Technology had some 20 years of experience with Adobe Illustrator program. He testified that Obama”s birth certificate opened in Adobe illustrator in 9 layers, which means that this is a document, which underwent computer manipulation. Mr. Papa testified that it cannot be a genuine document, as in 1961 there was no Adobe Illustrator. Birth certificates in 1961 were created not on the computer, but with a typewriter. He stated his opinion that this is a forgery. His exhibits, showing layers within the document, were admitted into evidence. Mr. Paul Irey testified that he has 57 years of experience working for NSA and later advertising, typesetting and computer graphics programs. Mr. Irey testified that Obama’s alleged birth certificate is a computer generated forgery. Mr. Irey had a large board with exhibits, where he showed enlargements of all the letters in Obama’s birth certificate. He vividly demonstrated that letters came from different typesetting, which in itself is a proof of forgery. Additionally Mr. Irey testified that when a document is printed with a typewriter, the spaces between the letters are the same, however in Obama’s birth certificate the spacing varies, which is a sign of forgery. Mr. Irey also testified that there is a white halo around letters in Obama’s birth certificate, which can exist oly as a result of computer manipulation. Mr. Irey testified that Obama’s birth certificate is a computer generated forgery. Decision by the court is expected within a week. 2:02pm EST: REPORT: 1:10 PM Hearing Over. Judge ended hearing in middle of defense cross examination. Orders from all parties due by close of business Thursday. 1:48pm EST: Orly Taitz Statement: This is Huge! Over objections by the defense we were able to admit into evidence all of the exhibits and testimony showing forgery in Obama’s birth certificate. Proposed order will be submitted by TH, decision by Judge Reid will be coming in the near future! Because of the persisting controversy about his eligibility, On April 27, 2011 the Office of the President at the White House released a document that is called “Long-Form Birth Certificate“. The release of this simple document, after two years of controversy, raised in our minds the possibility that there could be something suspicious about the information available on this document. To check this, we downloaded the document that was posted at the White House site at http://www.whitehouse.gov/sites/default/files/rss_viewer/birth-certificate-long-form.pdf. Zoom into the document 800%. Scroll down until you see the serial number of the document “61 1064” in the top right-hand side of the document. In full page view the number appears as “61 10641”. But, after magnification, the last digit “1” disappears! This last digit is also in a font that is different from the other digits. This is only one example. Many more examples can be discovered by examining magnified document with full page view of the document. Comparing the object above with the original document, it is seen that in the top right-hand corner of the document the last digit “1”, of the serial number of the form “61 10641” is missing. This repeats the same observation as seen in the simple magnified view of the document in the PDF Foxit Reader (see above). Copyright © 1999-2011 Israel Science and Technology Directory. 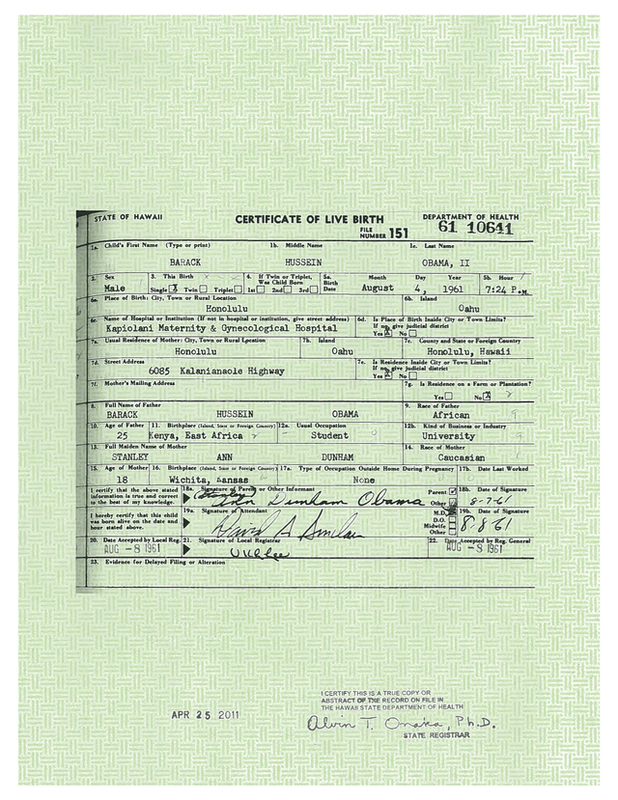 This is the forged long form birth certificate showing that the supposed 44th President of the United States, Barack Obama, was born at 7:24 pm, on August 4, 1961, in Honolulu, Hawaii, United States. He argued that Obama has shown no authenticate evidence to the New Jersey Secretary of State demonstrating who he is and that he was born in the United States. Apuzzo also argued that as a matter of law, Obama is not a “natural born Citizen” because he was born to a father who was not a U.S. citizen. As Obama’s legal argument becomes more contorted, he is being forced to avoid an ever shrinking legal space, and an increasing weight, of his failure to meet constitutional eligibility requirements. Hill, of Genova, Burn & Giantomasi Attorneys in Newark, made a desperate motion to dismiss the ballot objection arguing that Obama’s lack of natural-born citizenship status was not relevant to being placed on the New Jersey presidential ballot because no law exists in New Jersey which says that a candidate’s appearance on the ballot must be supported by evidence of natural born citizenship status. Only the U.S. constitution restricts eligibility to hold the office of president to natural born citizens. My friends, I consider myself to be a fairly rational individual and generally as an American I firmly believe in the freedom to believe in what we as individuals have the right as Americans to believe in what we feel is for the best for ourselves and our loved ones. I came across this article and was stunned at what I was reading. As I am eating my T-Day left-overs, watching college football, and thinking to myself how great it will be to get mt Christmas shopping done early, I almost choked on my ham sandwich as I was reading this horrific article. Never in my life have I ever had to endure these self-awakening experiences like I have these past three years since the “anointed one” was fraudulently elected to the Presidency of these United States of America. So many dots that still have not been connected in this man’s life, too many anomalies to count, aliases, three strikes on Obama’s bogus social security number, addresses across the country, nefarious friends and associates, and “vision quests” to countries that harbor communists and terrorists. Need I say more? The following video is a database pull that I personally completed on Obama’s alias, “Harrison J Bounel” that he has associated with his bogus CT social security number. This man does not have the best interest of this nation when it comes to his “Communist” , “Bolshevik”, education. The video is clear and indisputable evidence that this man is a fraud and his whole existence is fraudulent. “Barack Obama with his brothers Samson and Ben in 1987 in Nairobi. I have a perfect memory and I state that I saw the man in the center of this picture in Moscow in 1987, where I’ve been trained at KGB Intelligence Institute.” [Editor’s Note: This excerpt is from a 55-page document sent to me Tuesday by Kryzhansky, 53, left, who claims to be a former KGB Intelligence Officer and sniper. I find it confusing but worth posting for a discussion of Obams’s background . The picture above, which appeared in the Daily Mail in Oct. 2009 doesn’t look like Barack Obama. I have no way of knowing whether Kryzhansky is an impostor or not. The rest of the document is provocative but inconclusive. He has an youTube presence and a blog. Keep in mind, there are credible reports that Henry Kissinger was also a Soviet agent. So was Victor Rothschild (1910-1990). The KGB may be the ultimate instrument of the NWO. ] by Mikhail Kryzhanovsky (prof7prof@yahoo.com) (henrymakow.com) August 4, 1961- Barack Obama was born in Honolulu, Hawaii. If there’s something very wrong with someone’s birth certificate and if there’s an indication that this someone used a birth certificate of a newborn child (Virginia Sunahara) who died at birth or soon after birth, we have to talk about the methods Russian intelligence (SVR, a former KGB) and its illegal espionage department. We have to talk about one of the illegal spy “documentation process” – using birth certificates to get legal documents in USA – SS#, driver license, passport. There are two possibilities. First is – Obama was exchanged by a professional illegal spy, because of the “birth certificate” issue (that’s the #1 sign Russian illegal intelligence might be involved). Second – Obama was recruited and trained in 1981-1983 years in Moscow (“lost” Columbia University years). Most probably, he was just recruited. Now, let’s reconstruct Obama’s biography as I see it with my 30 years of espionage experience. Illegal spy cover story works best if it’s a mix of actual and fake facts. “Obama” (let’s call him John Smith) was a child of a student from Kenya who studied in Moscow and dated a Russian girl. Such kids in Russia were often unwanted by both partners and were raised and educated at a special school. Like Obama, John Smith was born in 1961 and, like him, graduated from high school in 1979. KGB paid attention to a very smart young man. Smith was an Intelligence Institute student in 1979-1981 in Moscow, not far from “Cosmos” Hotel. There are couple of buildings in the area and I got intelligence education myself in one of them back in 1987, (15 Yaroslavskaya Street, Moscow Russia). Then a decision was made to train him individually as illegal intelligence officer .The “dacha” (Russian for small villa) not far from Moscow, provides an ideally isolated territory for training. 2-3 instructors live there to immerse the candidate completely into his American identity and supervise him all the time… After special training candidate often goes through a special process: a) illegal probation period abroad. A trip abroad through intermediate countries with numerous changes of passports and cover stories, jobs, personal connections. Then he gets to the target country, stays there for another 1-2 years and goes back to his country for additional training and correction of cover story — actually, it’s his first combat assignment. The most important part of this assignment is to check the reliability of the cover story and documents; the cover story has to be reinforced with new and old true facts, like short-term studies at universities or professional training courses). b) intermediate legislation. On his way back the officer could stay in an intermediate country for another 1-2 years, make contacts with business, scientists, government employees, celebrities. c) basic legislation. Officer comes to the target country, obtains genuine documents, gets a job which allows him to travel and talk to many people, recruit informants thus creating an illegal station). At the same time, in 1979-1981, [the real] Barack Obama studied at Occidental College in Los Angeles where he became a socialist ready to transform the nation by redistributing wealth. KGB station in Washington, DC which was constantly looking for future secret sources at American top universities and colleges, like Columbia, Yale or Harvard, got information about young socialist. They sent his picture and info to Moscow where some resemblance was discovered between a college student from Los Angeles and a future illegal spy John Smith. Barack Obama is KGB/SVR illegal spy 1981 – Obama traveled to Indonesia to visit his mother and sister Maya, and visited the families of college friends in India and Pakistan for 3 weeks. Then something happened in India, a good friend to Soviet Union and a perfect place to recruit foreigners. He was recruited and he disappeared. John Smith aka Barack Obama came back to the United States – change of agents, one of regular illegal espionage methods. Obama’s father , Barack Obama Sr., aged 46 died in a car accident in Nairobi. His mother, Ann Dunham, lived in Indonesia and might be just avoided or ignored by her “son” (Don Johnson, Dunham co-worker, said “Obama was distancing himself from her”). Russians approached her under a “false flag” ( National Security Agency or CIA) and explained that her son had to stay abroad for a secret mission for some time. They told her that she had to be ready to accept another person as her own son. For operation like that, espionage agencies often recruit close relatives and allow them to meet their son (daughter) from time to time outside USA. Money talks, there’s nothing unusual, though for Dunham the pressure and depression was too big – she died in 1995 of cancer at 52. Time changes people, so “Obama” had to stay away from his friends and do not show up in public too much. 1981 – He transferred to Columbia University in New York City, where he majored in political science and where nobody could remember him at all, and graduated with a B.A. in 1983. “Obama” declined repeated requests to talk about his New York years, release his Columbia transcript or identify a single fellow student, co-worker, roommate or friend from those years. Wall Street Journal editorial in September 2008, titled “Obama’s Lost Years” noted that Fox News contacted 400 Obama’s classmates at Columbia and found no one who even remembered him. “Mostly, my years at Columbia were an intense period of study,” Obama told Columbia College Today in a 2005 alumnus interview. “I didn’t socialize that much. I was like a monk”. Perfect cover up ! Columbia has refused to release any records regarding Obama’s attendance, including his application to attend, his grades, and his financial aid records, if any exist. Only one person could order Columbia to shut up – CIA Director Leon Panetta. 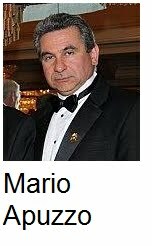 1983-1985 He worked at the [CIA Front] Business International Corporation and at the New York Public Interest Research Group. He worked in Chicago as community organizer in 1985-1988. 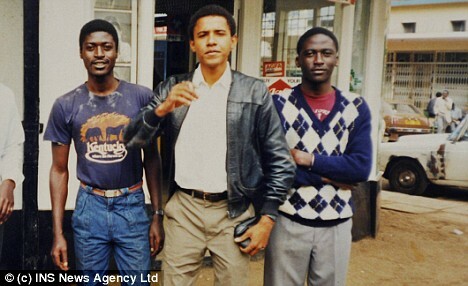 1987 – Barack Obama with his brothers Samson and Ben in 1987 in Nairobi. I have a perfect memory and I state that I saw the man in the centre of this picture in Moscow in 1987, where I’ve been trained at KGB Intelligence Institute. 1988 – He traveled to Europe to meet his KGB handlers and get new instructions. He had a choice – a safe variant (to make a political career in one of African countries), and a risky one of staying in America – KGB wanted him to be Martin Luther King #2 . But it appeared he could get much more which was Oval Office. It was decided he could stay in USA longer and it was a success : Illinois Senator (1997-2004) and U.S. Senator (2005-2008). 1988-1991 – In 1988, Obama entered Harvard Law School. During his summers he worked as a summer associate at the law firms of Sidley Austin in 1989 and Hopkins & Sutter in 1990. After graduating from Harvard in 1991, he returned to Chicago. 1995 – Ann Dunham, Obama’s mother, aged 52, died of cancer in Honolulu, Hawaii. 1997 – Obama was elected the Illinois State Senator 2004 – 1995 – Ann Dunham, Obama’s mother, aged 52, died of cancer in Honolulu, Hawaii. 1997- Obama was elected the Illinois State Senator 2004 – Obama was elected the US Senator August 5-7, 2005 – Senators Lugar and Obama in Russia — “Obama” visited Russia (together with Senator R. Lugar) and met secretly his SVR (former KGB intelligence) handlers to discuss his prospectives for the U.S. presidency. It appeared that U.S. Senator Barack “Obama” was getting out of control and Russians decided to teach him a lesson and delayed his flight over technicalities. 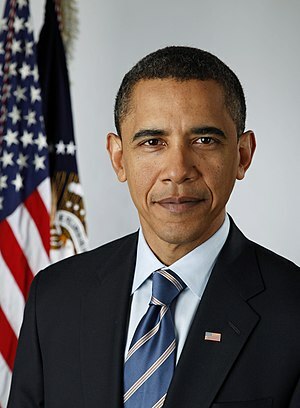 February 10, 2007 – “Obama” announced his candidacy for President of the United States. August 28,2008 – Nancy Pelosi conspiracy. Barack Obama and Joe Biden were nominated as Democratic candidates for the US President and Vice President. House Speaker Nancy Pelosi knew that Obama was not eligible under the US Constitution – that’s why she wrote the first variant of nomination certification and then changed it . .. November 4, 2008 – Obama won the race and became the first Russian illegal spy to be elected the U.S. President. The Congressional Research Service, a public policy arm of Congress, officially admits no one in the government ever vetted Obama’s constitutional eligibility. October 2, 2010 – He managed to fire Rahm Emanuel (I’ll tell you why) and after that Russians humiliated him one more time – in April 28, 2011, he was forced to nominate Panetta to replace Robert Gates as Secretary of Defense. Panetta would end all operations and withdraw all U.S. troops from Iraq – that’s another Russian intelligence order. Obama, actually, lost half of his power by giving two key Cabinet positions to Clinton’s team – that’s how Russians punished their illegal spy for his independence. 1.He’s destroying America – its called “socialist intervention into the US economy”. A person who wants to spend $1 trillion on health care reform which is not a priority at all in the middle of horrible economic crisis, is either an idiot or an enemy of America with a very well calculated plan to terminate the country. Obama did it – in March 2010 he signed Health Care Reform legislation into law. 2. He’s into immigration reform which is a socialist intervention into American society – he’ll turn 12 million poor illegal Latinos into US citizens-revolutionaries. In 2012 they’ll get green cards, by 2016 they’ll get citizenship and bring here all their family members (grandparents, parents, brothers, sisters, brides and grooms) – around 50-60 million unemployed poorly educated people. And that will be the death of America, the end of American Constitution and the birth of a totalitarian “Obama – forever ” Communist regime. 3.Rising unemployment and inflation, budget deficit at every state and city is another Obama’s trick, planned by Russian intelligence – he’s pushing big states like Texas, New York and California to a “boiling point” after which they might take serious steps towards independence – the beginning of America’s death. USSR collapsed the same way – now Russians through Obama want revenge. 4.While Bill Clinton saved one Russian “mole” John Deutch, Obama saved 10 (ten) Russian illegal spies, arrested by FBI in June, 2010, sending them back to Russia in 2010 without any investigation – severe blow to American national security and priceless gift. My GOD in heaven. What is it going to take to awaken the American people as to what this “Anti-American Trained Bolshevik” is doing in his warped attempt in dismantling our Constitution in order to re-create what our “Founding Fathers” created. Is Barack H Obama preparing the way for an invasion from our enemies? Is a “Civil War” eminent? 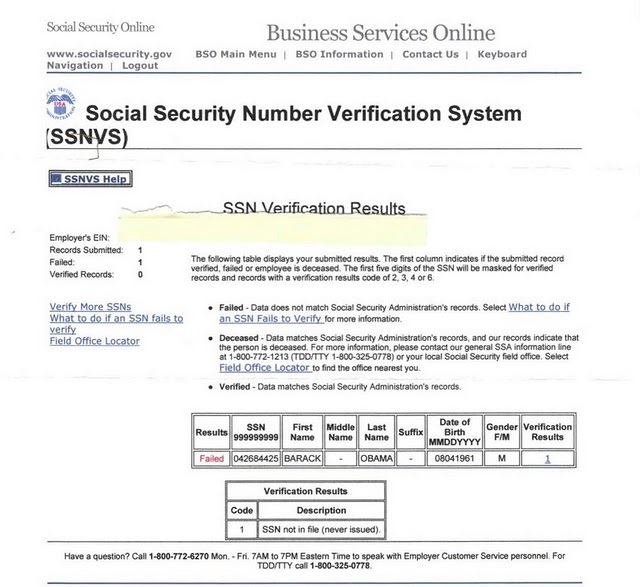 Exacerbating the problem of using the social security number as an identifier is the fact that the social security card contains no biometric identifiers of any sort, making it essentially impossible to tell whether a person using a certain SSN is truly the person to whom it was issued without relying on some other means of documentation (which may itself have been falsely procured through use of the fraudulent SSN). Why the “main stream media”backed themselves into a corner over the Birth Certificate issue is beyond me. Even my untrained eye could notice the abnormalities associated with the fake Birth Certificate the very same day it was posted to the White House‘s website. With out a proper Birth Certificate it is virtually impossible to obtain a valid Social Security Number and we all know that. And that point has been proven. 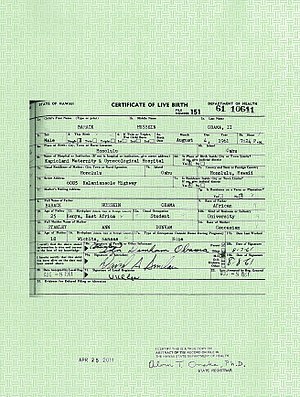 The only proof that Obama has of his birth is a computer generated counterfeit Birth Certificate. Now let us look at the social security number issue for what it really is, FRAUD. When Obama was still living in Hawaii he was still using the name Barry Soetoro right up until right up until his entrance to Occidental College in 1979. As we all know one has to have a social security number in order to apply for admittance to a college or university especially if one is an American Citizen. Plus all other forms of documentation needed by the institutions for the application process to be validated. What people do not understand or have forgotten in this era of computer generated validation processes is that in the good old days records were all kept separately. There were no computerized databases interlocked via database systems like there are today. So we were all pretty much taken at our word as far as our identities were concerned. It is obvious that Obama had to have had his CT SSN by the time he entered Occidental College in 1979 because he sure did not have any other form of documentation that he would have had to produce in order to enroll at Occidental College, or Columbia University, or Harvard Law School. So in keeping with the above information now let us look at what has been discovered as it pertains to Barry Obama’s, Barry Soetoro’s, Harrison J Bounel’s, and Barack H Obama’s social security number. Since the Obama alias was discovered nearly seven months ago by me there has been absolutely no evidence provided by anyone that can prove otherwise that this is not a valid alias that was discovered as one that was/is being used by Barack H Obama as of 2009. 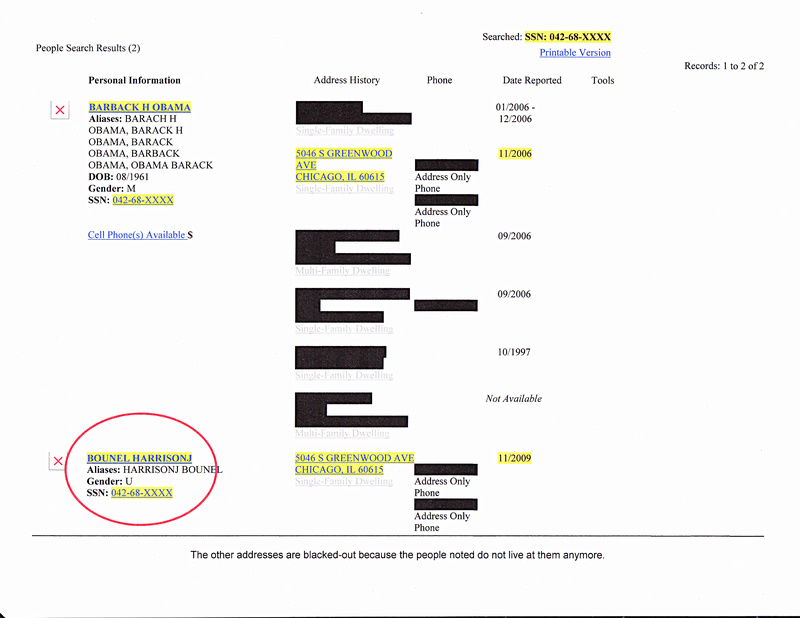 The above image is from a database pull that I completed on 05/13/2011 which has since been scrubbed from all databases as of 08/2011 and it clearly show the “Harrison J Bounel” alias that Obama was using as of 2009 which was shown to be using the bogus Obama social security number. Many individuals have pulled Obama’s bogus social security number over the few years since this “Unsolved Mystery of a Man” has been in the national spotlight and all of the results have been the same, the social security number does not belong to Barack H Obama. 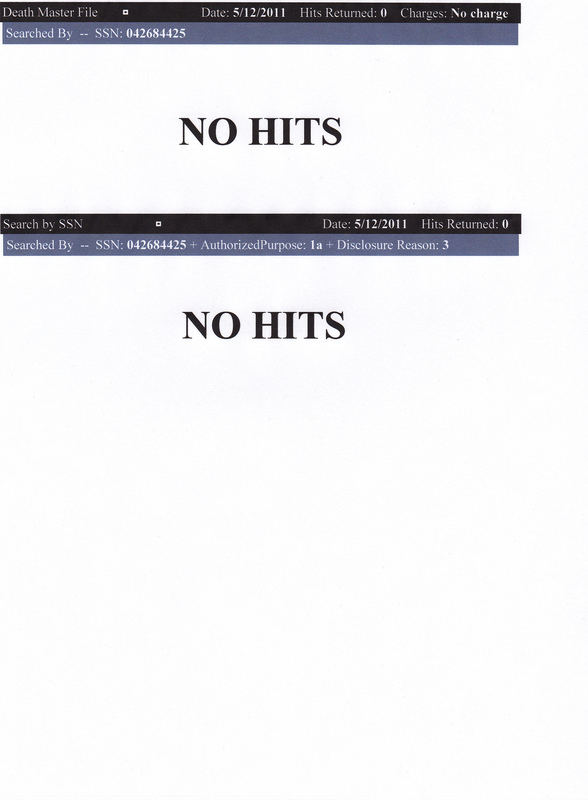 The above image is from a “pull” that was completed directly from the Social Security Administration’s (SSA) website back in 2003 and it clearly shows a “FAILED” result for a SSN pull using Obama’s name and supposed social security number. 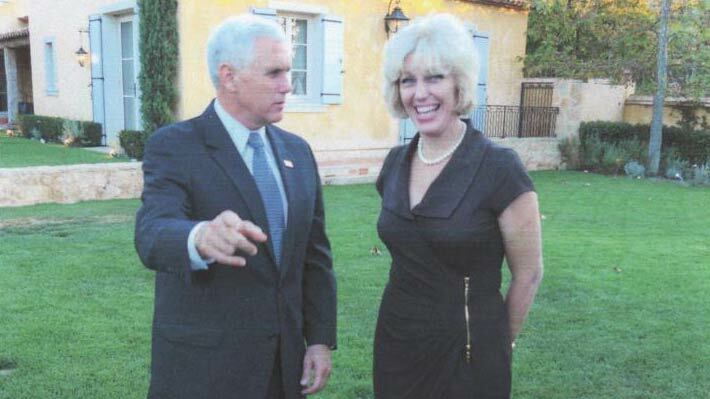 The following image was pulled from Orly Taitz’s website. 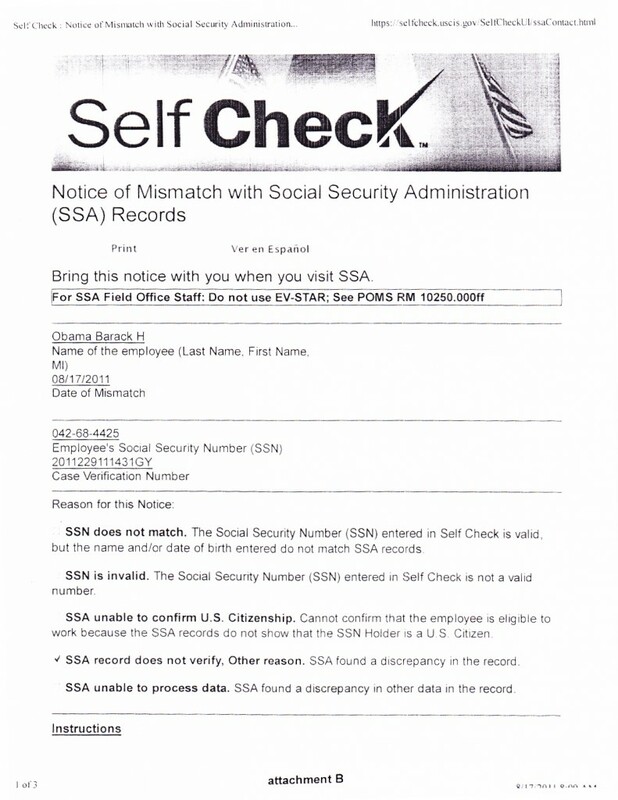 It clearly shows that the supposed Obama social security number does not match the name given. This particular search was completed just last month, 08/17/2011 so at least as of yet that database did not have the chance at being scrubbed by the OBOTS. Yet again more evidence that Barack H Obama and his many names are associated with a social security number that is not his. Furthermore, he has circumvented all legal authorities and their oversight as it pertains to his fraudulent activities since acquiring the bogus social security number back in the 1970’s.